What Is the Difference Between Pomace Oil and Olive Oil? Olive oil is extracted from the fruit of the olive tree. There are different types, grades and uses of olive oil, depending on how the original oil is extracted. Pomace oil is a lesser grade and quality than olive oil due to the way in which it is extracted and the chemicals used in the process. It is important that you know the difference between pomace oil and olive oil before using it to avoid misusing the product. According to Len Price in "Carrier Oils for Aromatherapy and Massage," the olive tree is an ancient, evergreen tree that is prevalent in the Mediterranean region, Israel and countries in northern Africa. The olive tree only produces fruit after 15 years; the fruit of the olive tree matures from green to black. Olive oil and pomace oil are extracted from the fruit of the olive tree. 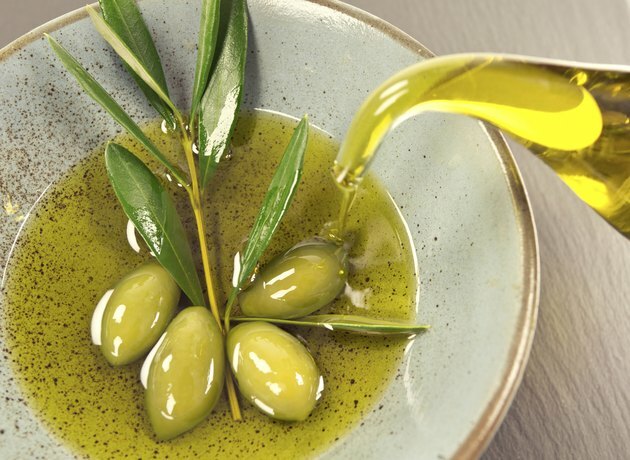 According to the University of California-Davis, olive oil is extracted from the fruit of the olive tree without the use of solvent extraction or any other chemical processes. Pomace oil is extracted from olive pomace with the use of solvents or other chemical processes. The olive pomace is the by-product of the extraction process of the original olive oil. Olive oil is cold-pressed whereas pomace oil is hot-pressed. Olive oil is graded according to extraction methods and quality; some types of olive oil are suitable for consumption in culinary dishes whereas lesser grades of olive oil are not fit for consumption. Extra virgin and virgin olive oil are graded the highest for quality and human consumption. According to the University of California-Davis, pomace oil is graded from a blend of refined pomace oil and virgin olive oil, that is fit for human consumption, to crude pomace olive oil that is only suitable for industrial purposes. Virgin olive oil has nutritional benefits and is used in salad dressings and culinary dishes. According to Mr. Price, olive oil also has therapeutic benefits and is used in aromatherapy and massage. Olive oil is present in many cosmetics and soaps. Crude pomace oil is usually used for industrial purposes only but pomace oil that has been refined is often used for deep frying and consumption in foods; refined pomace oil maintains some of the health benefits and characteristics of olive oil. However, virgin olive oil is a superior quality, grade and overall product than pomace oil.